I mentioned in my most recent “resurfacing from the pit of malaise” entry that I didn’t have anything on my needles. That’s still true, but I have unearthed two knitting projects I finished at the tail end of winter. I thought I still needed to weave in the ends, which I why I didn’t share them earlier, but as it turned out, I’d already done that, just needed to clip the threads on the second one. The hardest part about getting these camera-ready was finding one of the hats, which had escaped my knitting bag and gone to live in the cupboard with some unrelated balls of yarn. 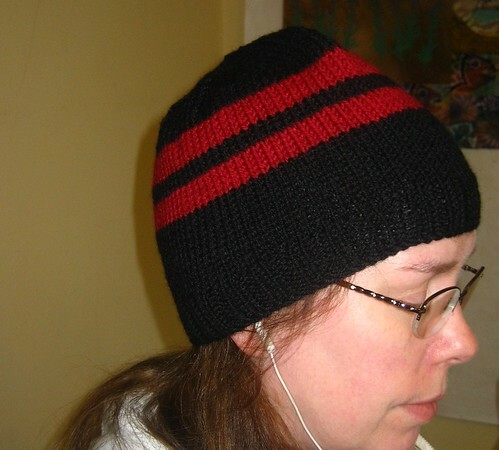 Cap number one is a simple black number with two red stripes. I used my go to pattern for non-cuffed caps with the usual modification for added length. The yarn is Plymouth Encore left over from other projects. I will likely give this to charity. I have plenty of hats already, this doesn’t coordinate with any of my coats especially well, and of course it’s good to do charitable stuff. 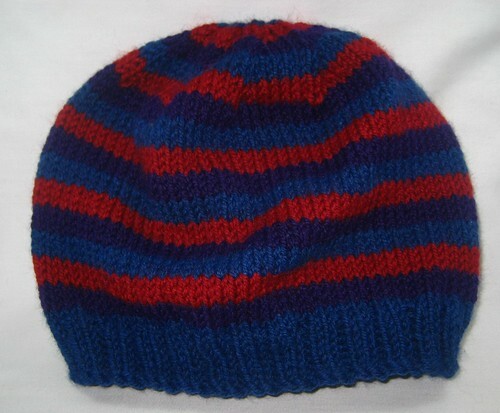 For cap number two, I used three colors of leftover Plymouth Encore to make narrow stripes, which I did because I liked the effect in the blue cap I made for Weetcon and wanted to try it with three colors (in this case, slightly dark red, dusty turquoise blue, and purple). I really like how it turned out, and want to do more narrow stripes in future. This one will also probably go to charity. I really need to start a new project but it’s hard to decide. Sweaters are out right now because a) I lack the motivation for such a big project and b) if I do lose the weight I’d like to it won’t fit anyway and I’d hate to waste all that work. I have plenty of sock yarn, and socks are wearable year ’round, so I might go that route. Or I could make a scarf or two and be ready really early for next year’s Weetcon auction (I’m assuming there will be one). Or perhaps more caps; they’re easy and I could experiment with those narrow stripes I’m so liking now. Maybe I’ll find some time this weekend to look through my stash and get inspired. How about Knitty.com’s Hey teach? it is a nice summery smallish sweater/shrug kind of thing. The empire waist makes it adaptable to several different body types and it does knit up fast.